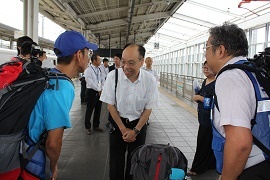 The coordinators departed Okayama Station at 8:33am by bullet train and arrived at Nagoya Station. 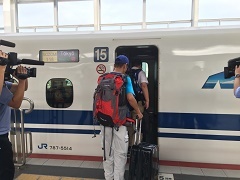 After connecting at Chubu Centrair International Airport, they are scheduled to arrive at Asahikawa Airport at 2:45pm. Then, they will head to Sapporo via a rental car. A departure ceremony was held before departing from Okayama. The two stated that Hokkaido has been damaged significantly and the victims must be suffering physically and mentally, and they expressed their desire to find any way to support them. Staff from local affiliate organisations also came to see the coordinators off and encouraged the two with handshakes.